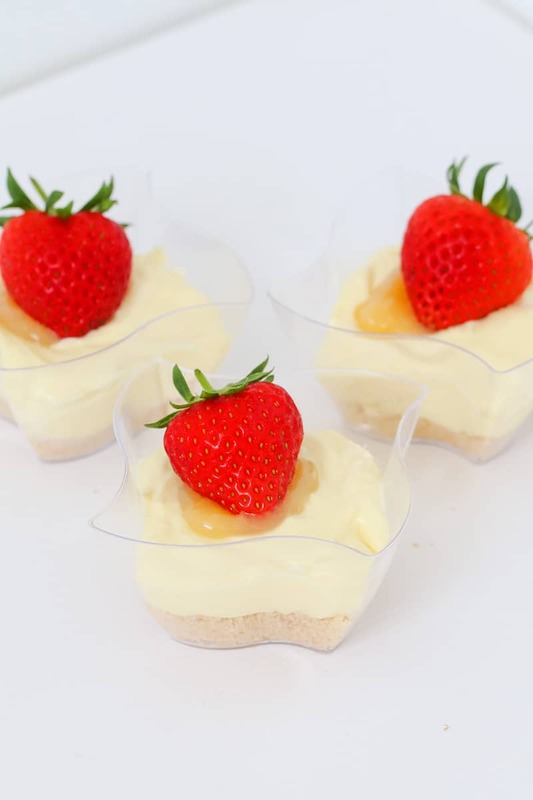 Fresh and zesty Lemon Cheesecakes that take just 15 minutes to make and are completely no-bake. 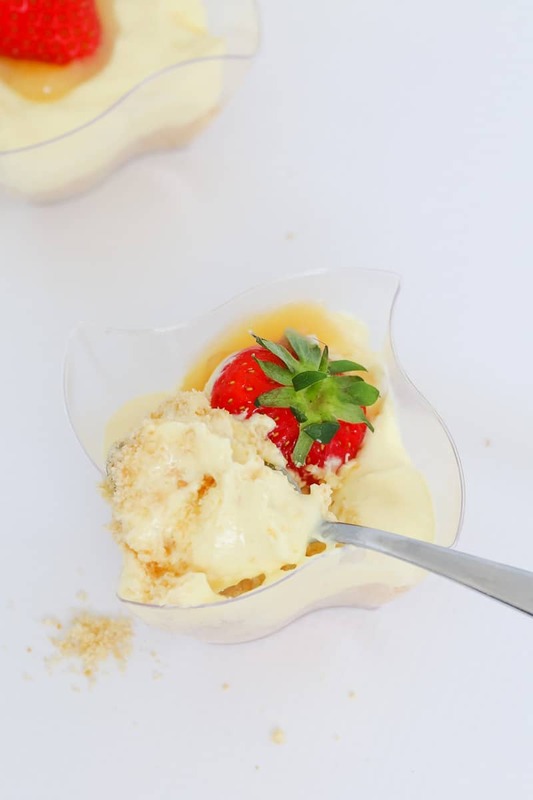 The perfect individual dessert! 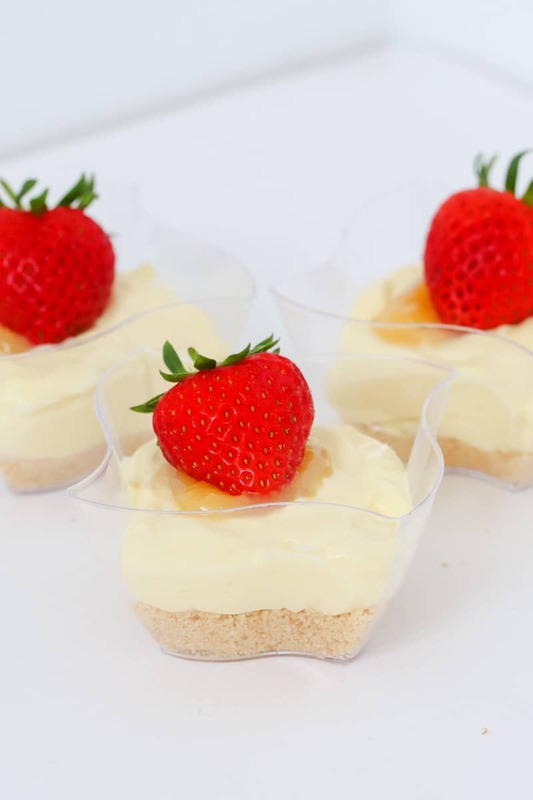 When it comes to sweet little individual desserts, these no-bake mini lemon cheesecakes should be at the very top of your must-make list! They’re super simple and taste absolutely delicious! These are always a crowd pleaser. 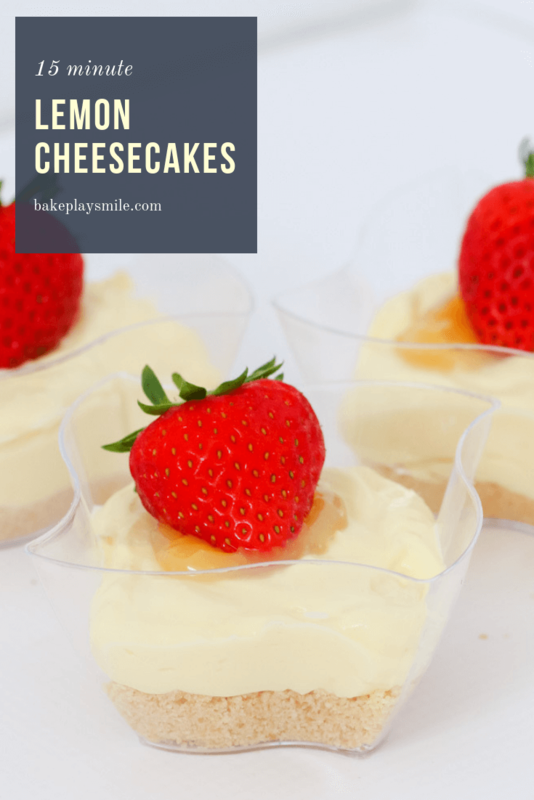 And to make these cheesecakes even more amazing, add a dollop of lemon curd and fresh strawberries to the top when serving. So yummy, zesty and fresh! 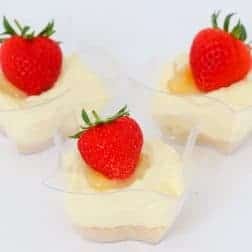 The easiest way to get no-bake cheesecakes to set quickly is to add gelatine powder that has been dissolved in water to the cheesecake filling mixture and beat it through. Check out my foolproof method below for dissolving gelatine powder without any lumps at all! How to dissolve gelatine without any lumps – the perfect method! 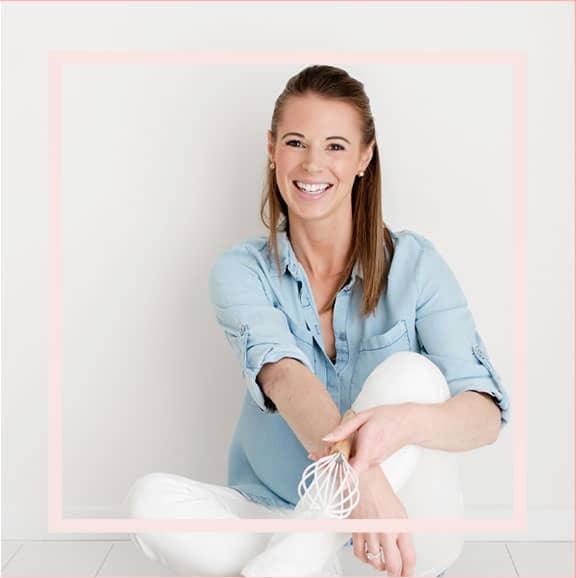 We’ve all been there… we’ve all tried to dissolve gelatine powder and ended up with a lumpy mess. But there’s a super easy method that solves that problem for good! So kiss goodbye to lumpy gelatine forever!! Sprinkle the powder over 1/3 cup cool water in a small bowl and allow to sit for a minute or 2 and then stir. 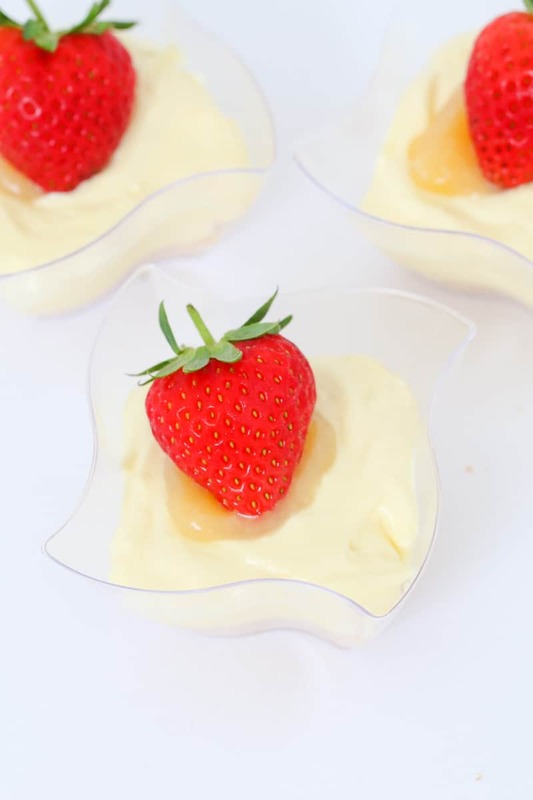 Place the small bowl into a larger bowl filled with boiling water (*do not allow the boiling water into the gelatine bowl) and stir until completely dissolved. Pour the mixture into the cheesecake mixture and beat through. If you want to ‘cheat’ and buy store-bought lemon curd from the supermarket, go for it!!! There’s so many amazing brands of lemon curd now that you’re almost crazy to make your own! But if you have lots of lemons you want to use up, then making homemade lemon curd is a fantastic idea! I recommend this recipe if you’re making lemon curd on the stovetop. 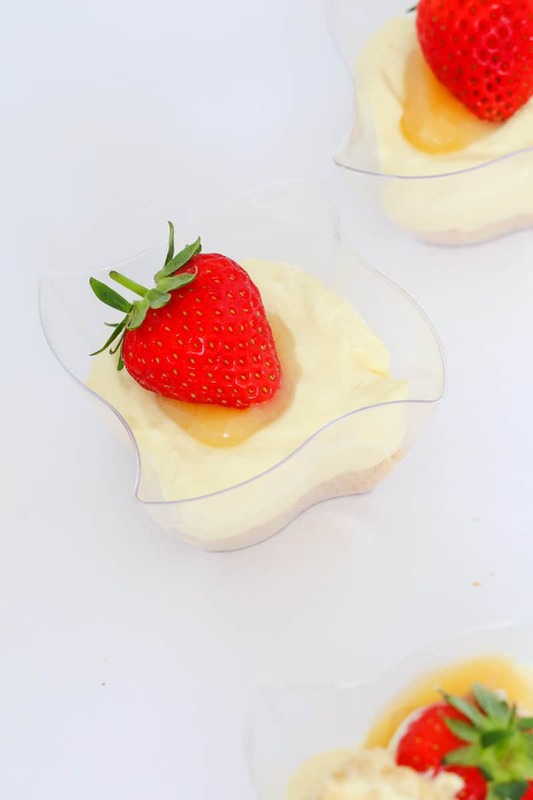 If you’re making lemon curd in the Thermomix, then this recipe is great. 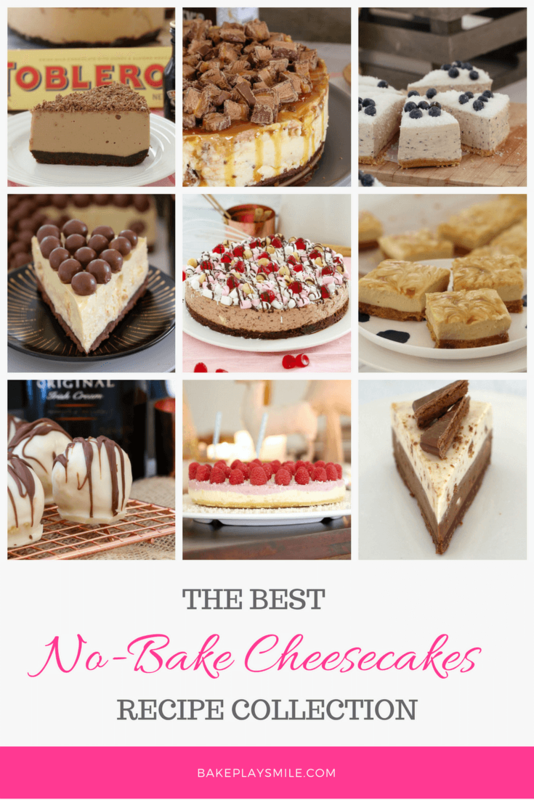 Now if you’re like me and LOVE n0-bake cheesecakes, then please, please check out this collection of my recipes (all with Thermomix and conventional methods). Crush the biscuits until fine crumbs remain. Add the melted butter and mix together well. Divide the mixture between 6 small serving bowls or glasses and press down firmly. Beat the cream cheese until smooth and creamy. Add the sweetened condensed milk, dissolved gelatine (see notes) and lemon juice and beat until smooth. Divide the mixture between the serving bowls and place into the fridge for 2-3 hours or until set. 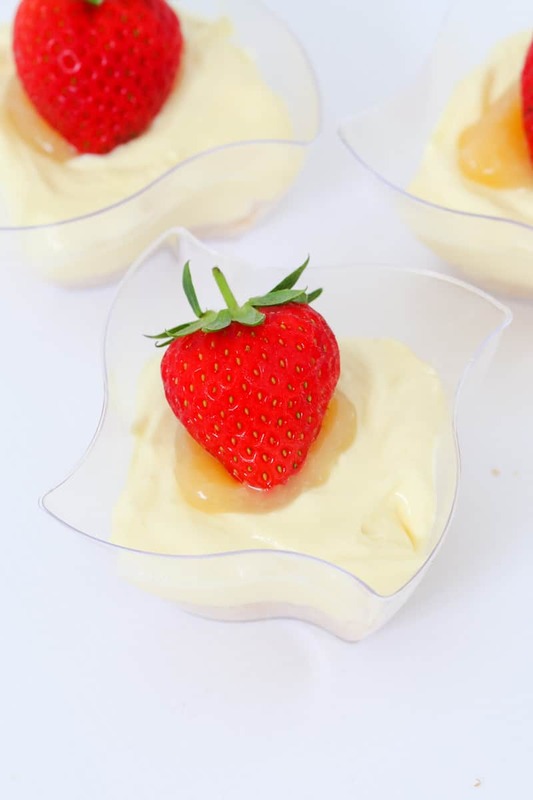 Decorate with lemon curd and fresh strawberries (optional). Place the butter into the Thermomix bowl and melt on 100 degrees, Speed 1, 2 minutes. Add the biscuits and crush on Speed 8, 10 seconds. Place the cream cheese into the Thermomix bowl and mix on Speed 6, 20 seconds. Add the sweetened condensed milk, dissolved gelatine (see notes) and lemon juice and mix on Speed 5, 30 seconds (scraping down the sides of the bowl partway through).